Rosella (Platycercus Vigors) Parrots belonging to this genus are collectively known as the rosella and all show two plumage characteristics; well-defined cheek-patches and a pronounced "mottling" on the back. The rosella is a medium-sized bird with long, graduated tails. There is a notch in the upper mandible. The male has noticeably wider, heavier upper mandibles than the female. In all but one species (icterotis) the rosella sexes are alike in plumage. The white, under wing-stripe, is present but is variable according to the species. The adult Crimson Rosella has a general rich crimson plumage; cheek patches violet blue; feathers of nape, back and wings black broadly margined with crimson. The bill is greyish-white; iris dark brown; legs grey. In eastern Australia, the Crimson Rosella is a bird of the coastal and adjacent mountainous forests from sea level to the alpine woodlands above 1,900 meters. It is plentiful, even occurring in numbers in the outer suburbs of large towns and cities. The flight is more undulating and noticeably slower than that of the Green Rosella and normally flies close to the ground and glides upward into a tree. The tail is fanned when alighting. The diet of the Crimson Rosella is seeds, fruits, blossoms, and insects and their larvae. Its call is a low pitched "kweek...kweek...kweek", with the middle note on a lower scale. When alarmed the Crimson Rosella has a series of shrill, metallic screeches. A soft chattering generally accompanies feeding. The courtship display and general nesting behaviour of the Crimson Rosella closely resemble those of the Green Rosella. The male Eastern Rosella has a red head and breast; white cheek-patches; lower breast yellow merging into the pale green on the abdomen. The bill is greyish-white; iris dark brown; legs grey. The Eastern Rosella occurs in south-eastern Australia, including Tasmania. The Eastern Rosella inhabits lightly timbered country up to about 1,250 meters and is a familiar bird in gardens and parklands on the outskirts of towns and cities. The undulating flight of the Eastern Rosella is comparatively swift. The inverted arc path is usually followed, but on long flights, particularly over open grassland, the Eastern Rosella flies at a considerable height and does not drop to the ground. The call of the Eastern Rosella is a loud "kwink...kwink...kwink" on an ascending scale or a metallic piping note repeated twice; when alarmed a shrill screech. The courtship display of the Eastern Rosella is similar to that of the Green Rosella. The male Green Rosella has a red frontal band; head and underparts are rich yellows, the latter sometimes washed with orange-red; cheek-patches are deep blue. The bill is horn coloured; iris brown; legs grey. The female is a smaller size with a smaller bill; throat generally washed with orange-red; wing stripe usually absent. The Green Rosella occurs in Tasmania and the larger islands in the Bass Strait. Because of the sombre colouration of their upperparts, it is inconspicuous when on the ground seeking seeds or when in the tall eucalypts feeding on blossoms. The flight is strong with less undulation than that of the other rosella species. Its diet comprises seeds, blossoms, berries, nuts, fruits and insects and their larvae. The call is a disyllabic "cussik-cussik" given regularly in flight; also a variety of flute-like whistles. When alarmed the Green Rosella emits a rapid succession of shrill piping notes. The male, when displaying, droops his wings, squares his shoulders, fluffs up his breast and upper tail-coverts and moves his fanned tail from side to side. The male Yellow Rosella has pale yellow head and entire under-parts. The throat and upper breast are often lightly marked with red. The bill is greyish-white; iris dark brown; legs grey. It occurs in the interior of south-eastern Australia; a riparian species closely associated with the Murray - Murrumbidgee - Lachlan Rivers system in southern New South Wales, northern Victoria and eastern South Australia. It frequents eucalypts, especially where they form savannah woodland on flood plains extending some distance from the watercourses. It is less confining than the other rosella species and generally moves well ahead of an intruder. Its flight is swifter and less undulating than that of the Crimson Rosella. The flight path is direct and lacks the inverted arc. The diet comprises seeds, fruits, berries, blossoms, nectar, nuts, and insects and their larvae. The call is similar to, but of a slightly higher pitch than that of the Crimson Rosella. Courtship display and general nesting behaviour of the Yellow Rosella closely resemble those of the Green Rosella. The adult Adelaide Rosella has a red forehead and crown; nape and sides of the head are dull orange-yellow; cheek-patches are violet-blue. The bill is greyish white; iris dark brown; legs grey. It occurs in southern South Australia from the southern Flinders Ranges to the Fleurieu Peninsula south of Adelaide. It is abundant within its restricted range, and inhabits all types of timbered country, and is often seen in suburban gardens and parklands in Adelaide. Its flight is similar to that of the Crimson Rosella. All call-notes of the Adelaide Rosella are similar to those of the Crimson Rosella. The breeding season extends from September through to December. Nesting behaviour, including courtship display, closely resembles that of the Green Rosella. The male Pale-Headed Rosella has a white head with tinges of yellow; check-patches violet-blue below, white above. Its bill is horn-coloured; iris dark brown; legs grey. The Pale-Headed Rosella is widely distributed from northern Queensland, south of Cairns and the Mitchell River, to northern New South Wales. It is a lowland bird inhabiting most types of the timbered country including clearings in a heavy forest or the forest itself where it adjoins open grassland. The flight resembles that of the Eastern Rosella. Its call is similar to that of the Eastern Rosella. The nesting behaviour resembles that of the Green Rosella. The forehead, crown and nape of the adult Northern Rosella are black, sometimes with red markings; cheek-patches white above, violet-blue below. The bill is greyish-white; iris dark brown; legs grey. The Northern Rosella inhabits north-western and northern Australia from the Kimberley, Western Australia, and east to the Northern Territory - Queensland border; occurs on Bathurst, Melville and Milingimbi Islands. It inhabits savannah woodland, timber bordering watercourses, littoral forests and occasionally coastal mangroves. The undulating flight of the Northern Rosella is surprisingly swift and somewhat erratic, normally flying close to the ground, gliding up into a tree and then fanning the tail before alighting. The diet of the Northern Rosella comprises seeds of grasses, shrubs and trees, principally eucalypts, melaleucas and acacias, and fruits, berries and blossoms. The call is a disyllabic, high pitched note repeated three or four times. When feeding in the treetops a soft chattering is emitted. The courtship display and general nesting behaviour are similar to the other rosella species. The head and entire under parts of the Western Rosella is red; yellow cheek patches; feathers of back and wings black broadly margined with dark green. The bill is grey; iris dark brown; legs brownish grey. The Western Rosella inhabits south-western Australia. In open forest trees surrounding croplands or lining roadways, timber bordering watercourses, grasslands and cultivated farmlands. It is a confiding bird and becomes very tame around farm buildings were feeding on spilt grain. Its buoyant, fluttering flight differs markedly from the heavy flight of the other rosella species. Between wing beats, there are only very brief periods of gliding. It feeds on seeds of grasses and herbaceous plants, fruits, berries and insects and their larvae. The call is soft and melodious, comprising a series of whistle-like notes repeated rapidly, and it lacks the harsh, metallic tones common to the calls of the other rosella species. The breeding season extends from August through to December. Only the female broods and while she is sitting, the male remains in the immediate vicinity of the nest. Native to Australia and New Zealand the Kookaburra bird is a large bird (28-42 cm in length and 11-17 inches in height). The Kookaburra was discovered by the English in the mid 18th century. They have a distinct call which sounds like a loud echoing human laughter, these birds are good-natured if not hysterical. You generally will not find this bird by water but they can be found in a humid forest surrounding where food is easily accessible. Kookaburra is carnivorous, their diet consists of lizards, snakes, insects, and raw meat, The Kookaburra is a territorial bird and they can often be found living with partially grown chicks from the previous mating season. Wild Kookaburras will eat baby birds, snakes, insects, small reptiles and other birds such as finches. Even though these birds are found only in a relatively small part of the world their unique sound can be found in the soundtrack "jungle sound", they are also used in movies and television as well as being seen in certain Disney park attractions. Also, you can find these birds in popular video games such as Battle toads and World of Warcraft. They can also be found on postage stamps, the first postage stamp with a Kookaburra was issued as a 6 penny stamp issued in 1914, and also a 38c Austrian stamp with a pair of Kookaburra on it was issued around 1990. Also back in 1990 Australia dedicated a coin to this bird. And if you want to read more about the cricket team of the native country of this bird, visit http://cricketfreaks.contentcreatorz.com. Are you a Cricket Freak? If yes, hello, am also one! http://cricketfreaks.contentcreatorz.com/ shows my passion for cricket. Please visit my blog if you want to read good and interesting stuff about cricket. After all, we are all cricket freaks! Lots of popular pet bird species originate from Australia, most of the well-known pet birds are native to this country but not all of them. Many are from the Americas, Africa, and Asia, but the most popular by far and through the sheer numbers in captivity are the Australian species, which range from small finches, right through the range to large parrots. Famous breeds like the budgerigar (know as the parakeet in some countries), cockatiel, zebra finch, lorikeet, and the cockatoo all became available throughout the world via importation from Australia. When our ancestors first discovered the Australian continent they found many types of animals that were unique to this part of the globe, such as the now infamous 'duck-billed platypus' and the 'echidna' (egg-laying mammals! How strange must that have been? ); marsupials such as the 'kangaroo', 'wallaby', 'Koala' and many new and unique bird species; many of which were very brightly coloured. So they desired specimens of these birds to take home, and in doing so boosted the fondness of exotic pet bird keeping. Starting with the smaller breeds; Australian finches that are popular as pets include the 'star finch', 'Gouldian finch' and the well known and readily available at a low price 'zebra finch'. However, there are much more. Small to medium sized parrot-like species from Australia include the most popular small pet bird of all, the 'budgerigar' (or 'parakeet'). The almost as popular 'cockatiel' is also an Australian native, plus no end of other well-known pet birds. The list is almost endless: 'lories' and 'lorikeets' (several types of these), parakeets such as 'turquoise', 'Bourke', 'splendid' 'elegant' and 'red-rumped' to name a few, there's loads more. The medium sized 'Eclectus parrot' also hails from this part of the world. The 'rosellas' are also medium parrot from Australia and about 6 different varieties are used as pets; 'Eastern', 'Northern', 'Western', 'Crimson', 'green', and 'pale-headed'. All are unique and different in their own way but are closely related. Rosella is known for their strikingly rich coloring, making them a very desirable pet. Finally the big daddy of Australian pet birds, the 'cockatoo'. There are about 20 different species of cockatoo but not all are popular as pets, and believe it or not the famous 'cockatiel' mentioned earlier is a member of this bird family but of course nowhere near as large as some of its cockatoo cousins. All birds in the cockatoo family are distinguishable by the crest of feathers on the top of the head. Many breeds of Australian birds live in massive flocks in the wild. The sight of hundreds of budgerigars, cockatiels, finches or lorikeets flocking together is an awe-inspiring sight, and very noisy. To summarise there is a massive range of Australian birds available as pets all over the world. Many are very colorful, easy to keep, very hardy and all have unique and sometimes entertaining characteristics. The least costly of exotic pet birds are also native Aussies. Is it any wonder that these pet birds are so popular? Of all native Australian birds used as pets, the rosellas are amongst the most sought after. This is due to their wonderful variety of coloring, their size, and their unique markings. Their scalloped feather markings on the back are what makes them unique in the avian world. There are several different species of rosella, all of them unique in their own way, and they all have similar requirements when used in aviculture. Common in all rosellas is the scalloped pattern to the feathers on the back and all have distinctive cheek patches. A very colorful and medium-sized parrot native to Australia and the surrounding islands. On the Australian mainland, these colorful birds tend to inhabit areas of farmland, woodland, forests and suburban gardens and parks, in the coastal mountains and plains but not the outback. Specific breeds tend to inhabit a particular area. Most species of rosella live in large flocks in the wild but not all.It is commonly held that their name originates from the area of Australia in which they were first noticed by early pioneers, the Rose Hill area of Sydney. The most common species appear to be: Western Rosella - smallest of the species with two subspecies itself and is found in south-west Australia. Crimson Rosella - five subspecies and inhabiting east and south-east Australia. Green Rosella - the largest species and native to Tasmania. Pale-headed Rosella - two subspecies and found in the eastern part of Australia. Eastern Rosella - three subspecies and although native to the eastern area of the country they are found in many regions including Tasmania and have been introduced to New Zealand where feral populations can be found. Northern Rosella - mainly found in the north as the name suggests but can also be seen in open savanna country and a few other areas, this one is also more likely to be found in small groups or just in pairs in the wild. All these are popular as pets. An aviary is the best option when keeping rosellas in captivity as this ensures an environment as close to their natural habitat as possible. If an aviary is not an option then they will do OK in cages, as long as the cage is adequately large enough for their requirements. They will need to have regular exercise outside the cage however and should get the opportunity to have a fly around. These birds are not usually talkers and will mainly chirp & squawk, although they could learn a few unique sounds or the odd whistle. A single rosella will form a very strong bond with its owner. They are best kept alone or in pairs as they can be very aggressive towards each other if a lot are enclosed together, a strange thing about captive ones this is as they tend to live mainly in flocks in the wild. Whether kept in aviary or cage try to only have no more than two, and ensure they are of the same species subfamily. These birds will fight to the death in captivity if different sub-species are allowed access to each other, so make certain that if keeping more than one type of Rosella to separate the different sub-species by housing in separate aviaries or cages. If the aviaries are connected together you must at the very least double-mesh so as these birds cannot get any physical contact. Beautiful birds yes, they do have these requirements, however, but they are easily achievable. 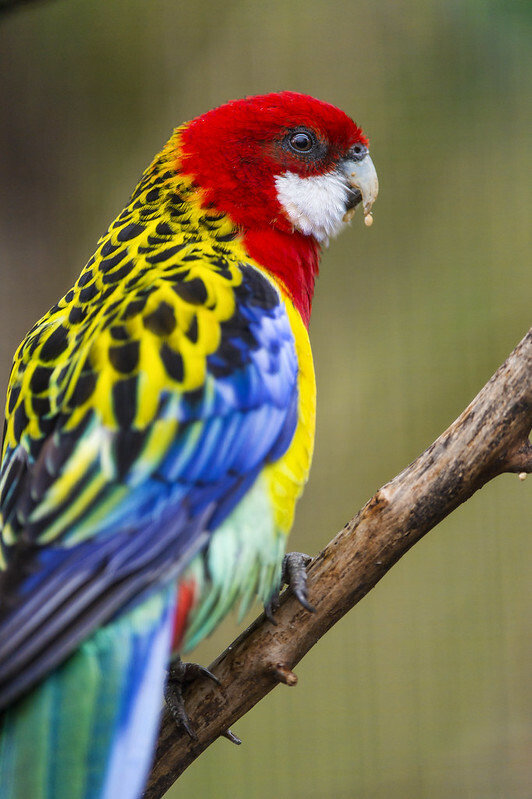 Most bird keepers will suggest that rosellas are not to be kept in a mixed aviary with other types of birds because of their aggressive nature. This may be so but I have in the past kept a pair of Eastern Rosellas (golden-mantled rosellas) in the same mixed aviary with budgies, cockatiels, grass parakeets and kakarikis and have had no problems, the rosellas tended to keep themselves to themselves and do their own thing. It would be best to get advice from an avian professional if unsure. To summarise there are several types of rosella available to the bird keeper, but their demand can often lead to having to pay a substantial fee in order to purchase any. Their physical appearance, however, is well worth the expense. 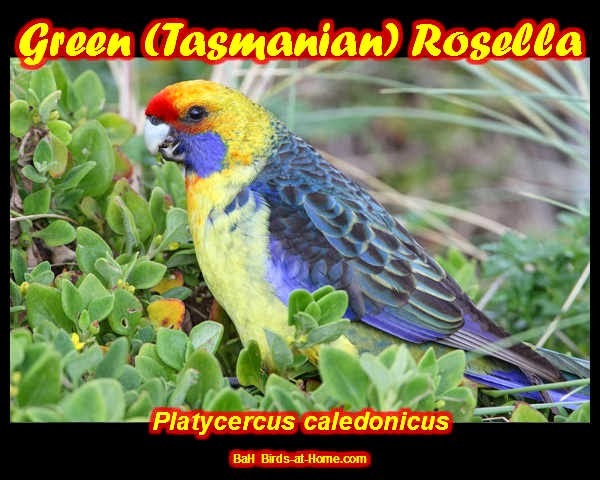 For more about rosellas please email me with your questions or visit my pet bird blog at http://StantonBirdman.wordpress.com/. Hobbyist keeper and breeder of pet birds for over 10 years. The Laughing Kookaburra, Dacelo novaeguineae is also called the Laughing Jackass, or simply the Kookaburra. There are actually two species of Kookaburra. As well as the Laughing Kookaburra so familiar to people in the southern states of Australia, there is a Blue-winged Kookaburra, Dacelo leachii, which lives in eastern Queensland. The ranges of the two species overlap. This article is about the laughing Kookaburra. At Raptor Domain near Vivonne Bay on Kangaroo Island, Dave Irwin included two Kookaburras in his "Birds of Prey" show. The Kookaburra is not technically a raptor, but shares some characteristics with the raptors. The Kookaburra is a large Kingfisher. In the Australian Bush they do not catch many fish because there is little water. In settled areas, Kookaburras will certainly catch Goldfish out of garden ponds. There also catch other pond fish, but brightly coloured fish are easier to see. In the Bush, the Kookaburras eat almost any animal of the right size. This includes venomous snakes, lizards, small birds, earthworms, insects, mice, etc. Dave Irwin told us that a few days before we saw his show both the Kookaburras caught and ate mice during the show. When an animal is caught by a Kookaburra, the bird will kill the little animal by beating it against a branch. Kookaburras that live near Humans can become quite tame and will come for pieces of meat. The Kookaburra will still beat the meat and make sure it is dead. The natural range of the Kookaburra is the whole of eastern Australia, including South Australia and Kangaroo Island. They are not native to Tasmania, Western Australia or New Zealand, but have been introduced to these areas. The kookaburra is a protected bird in the areas it is native to, but is not endangered. Kookaburras are believed to mate for life. They breed from August to January. Not only do the two parents share the upbringing of the new babies, but also their offspring from the previous two years help with their younger siblings. The nest is typically a natural hollow in a tree, or sometimes a hole in a termite mound of the type that is in a tree. The name Laughing Kookaburra comes from the cry of this bird which sounds like raucous laughter. The Kookaburra will typically perch while looking for prey. Dave Irwin was able to demonstrate an interesting adaption of the Kookaburra. Tree branches often sway in the wind. The kookaburra can compensate for minor swaying and keeps its head still so it can concentrate on looking. Steve Challis has articles on a wide range of subjects at stevechallis.net. This includes an increasing range of animals articles such as The Red Kangaroo at http://stevechallis.net/Red-Kangaroo.php. Steve also has a lot of fish fact sheets at http://www.bettatrading.com.au./.